The way that tetanus neurotoxin enters nerve cells has been discovered by scientists from University College London, who showed that this process can be blocked, offering a potential therapeutic intervention for tetanus. This newly-discovered pathway could be exploited to deliver therapies to the nervous system as a new way to treat motor neuron disease. 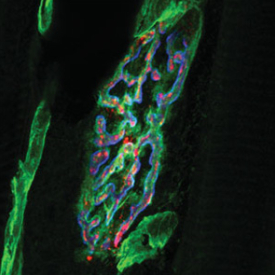 Image showing how tetanus neurotoxin (red) binds to areas rich in nidogen-2 (green), courtesy of Giampietro Schiavo. The research in mice, published in Science and funded by the Medical Research Council, shows that proteins called nidogens that coat cell surfaces are key to tetanus neurotoxin entering the nervous system. Tetanus neurotoxin sticks to nidogens on nerve cell surfaces, and is then ‘shuttled’ into these nerve cells where it spreads and causes damage across the nervous system. “Treating neurological disorders is incredibly challenging, and finding a way to get therapies to motor neurons is half the battle,” says senior author Professor Giampietro Schiavo from the UCL Institute of Neurology, who led the study. “Now that we understand how tetanus gets in, we hope to mimic the mechanism to deliver advanced therapies. “There are virotherapy approaches being developed to target motor neurons, but methods that rely on creating new routes into cells can cause damage. Our discovery should complement virotherapy, as protein engineers could design molecular shuttles that bind to and enter motor neurons in the same way as tetanus. The qualities that make tetanus such a powerful neurotoxin could help us to develop targeted treatments for patients with some of the most debilitating and paralysing conditions.